Aïda Ruilova and Alissa Bennett join Richard Flood, New Museum Director of Special Projects and Curator at Large, for a conversation and special premiere screening of a new video work starring Abel Ferrara and Alissa Bennett. 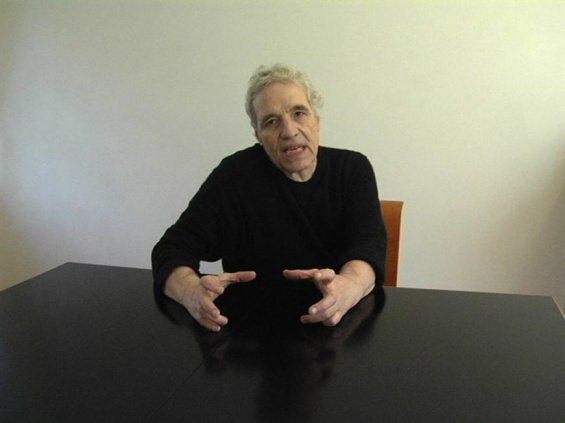 The video starts as a conversation with Abel Ferrara about Pier Paolo Pasolini’s death and then veers off into a tangential discourse on love, hustlers, desire, drugs, conspiracy, film scripts, and the actress Zoë Lund. Ruilova was a nominee for the 2006 Hugo Boss Prize. Her work has been featured in the 50th Venice Biennale, the 2004 Whitney Biennial, and the 4th Berlin Biennial, as well as Tate Britain, London, ZKM, Karlsruhe, The Kitchen, NY, and the Museum of Modern Art, NY. Projects include selection for the 2007 Rotterdam International Film Festival, Performa 2009, and a Hammer Project “Meet The Eye’‘ commissioned by the Hammer Museum. Ruilova’s first museum survey exhibition traveled to the Aspen Art Museum, St. Louis Contemporary Museum of Art, MOCA Cleveland, and Contemporary Arts Center New Orleans between 2009 and 2010. She has an upcoming exhibition at Kayne Griffin Corcoran gallery in the spring of 2013. Her work is included in the collections of the Whitney Museum of American Art, the Sammlung Goetz, the Hammer Museum, and the Solomon R. Guggenheim Museum. Writer Alissa Bennett’s work appears regularly in various literary journals and small press quarterlies. She has collaborated with artists such as Sue de Beer and Bjarne Melgaard whose current show at Luxembourg & Dayan Gallery was curated by Bennett. “Head and Hands” is the fourth project that she and Ruilova have worked on together.